Course categories are necessary for some of the useful functions in the High School V Planner; I encourage you to use the course categories. What are Course Categories in the V Planner? A course category is relatively broad label that will include courses that fall under the label. While it’s clear that I am making this up, course categories are a real thing. How about an example? I hope that even with my awkward definition, you now know with certainty what the course categories are in the V planner. Assuming that you plan to use the course categories, and I hope that you do, go to the Lists worksheet and edit the existing course category list. The list might already be okay – I based it off the most commonly used course categories that are used by high schools in the USA during the year that I set this particular V Planner up. See the image below; Read the image below. Part 3 in the Plan worksheet will not work if course categories are not selected at the Data(1,2,3,4) worksheets. Why would you want Part 3 to work? Part 3 checks your course of study that is laid out at Data(1,2,3,4) and attempts to warn you if you have not planned enough courses to meet the required credits by your state. Of course, this requires that you fill in Part 1 of Plan as well as selecting a course category for each credit-earning class that your student is taking. Course Descriptions require course categories, seriously, if you do not select a category when setting up classes at Data(1,2,3,4) you cannot use the course descriptions. Not everyone writes course descriptions, so this is not a big deal. 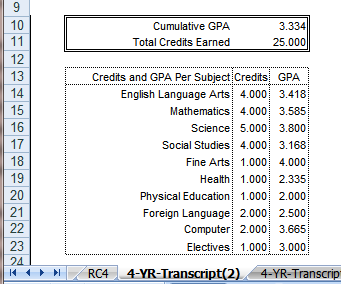 4-Year Transcript(2) – a summary of cumulative GPA and credits above a table of courses (the categories), credits and gpa are displayed at the upper right side of Transcript(2). If you do not use course categories, you cannot use this particular transcript. There is another transcript that you can use, the one called Transcript; it does not use course categories – You see, I did not assume that everyone would want to use the categories. 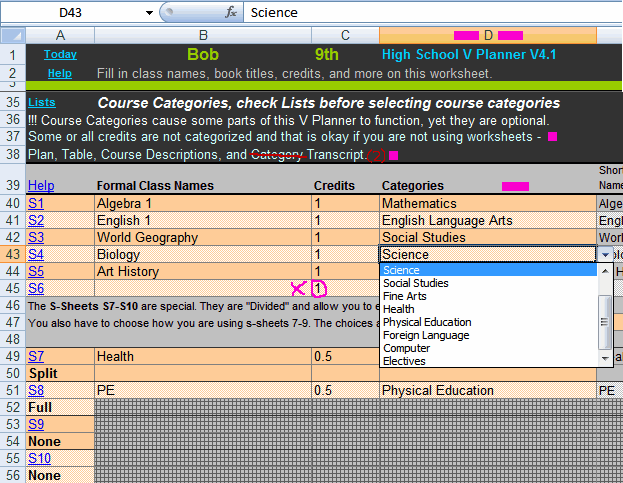 Lastly, the wonderful Table worksheet will display the course category alongside the other records for each class. 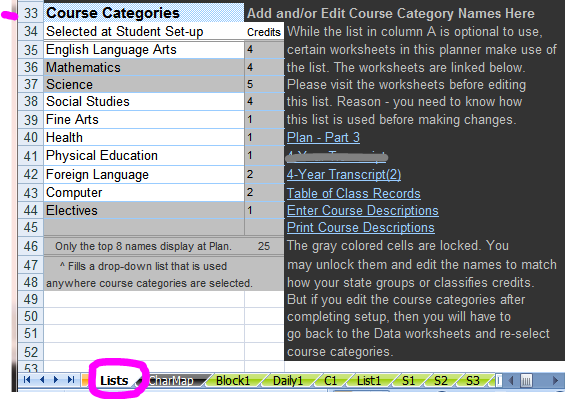 Sadly, if you do not use course categories, you cannot use the category selector that is at the top of the Table worksheet. Where Are Course Categories Selected? After making sure the course categories are correct at the Lists worksheet, and that is an important first step, select the categories from a drop-down list in column D that is on the various Data(1,2,3,4) worksheets when you set up the classes. Row 37 lets you know if all of the credits are not categorized. Row 38 tells you which worksheets are affected. Note: wording in rows 35-38 may differ from the image below in your V Planner, but that doesn’t matter. Side-note- If you need to see the requirements for graduation for your state, and probably their course labels (categories), then ask your local homeschool group for information, search the web, or look at List of Links – High School Requirements per State page at donnayoung.org. RC-1 is the report card. Unlike the Transcript everything, up to some item limits, appears on RC1.